« Blot’s 50 Shades of Lies Print-raiser! Join us at Small Prestivus! 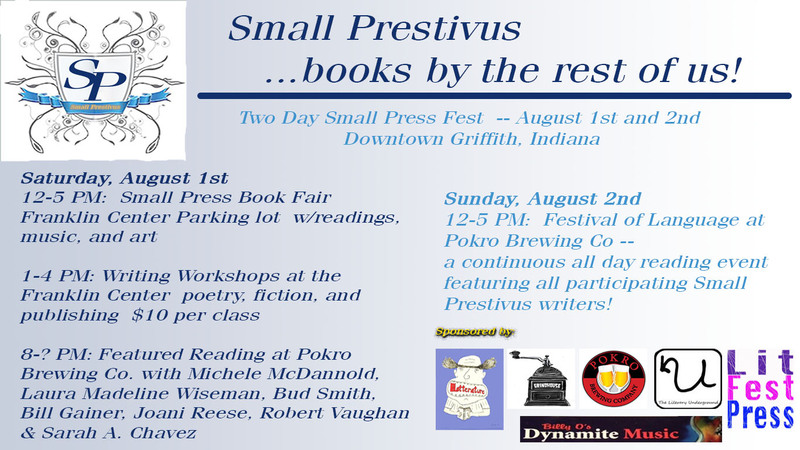 Blotterature Literary Magazine and Lit Fest Press are promoting the diversity of small presses and the writers they represent at “Small Prestivus,” a two day small press fest. We invite all writers and the public for this free event! The fest is set to include writing workshops; an outdoor book fair with singer/songwriters, open air readings, and visual art demonstrations; a Saturday evening reading featuring Michele McDannold, Laura Madeline Wiseman, Joani Reese, Bud Smith, Bill Gainer, Sarah A. Chavez, and Robert Vaughan, with a one-shot open mic where all participants will have a chance to read after, and an all day Festival of Language where all participants will again have a chance to read on Sunday sponsored by Lit Fest Press. Please note that this festival is to showcase writers in the small press. We will not be offering tables to self publishers. If you would like to reserve a table please message Blotterature Lit Mag or Lit Fest Press. Tables are $10 for individual writers and $20 for presses. Small Presses signed up to rep at Small Prestivus, so far..